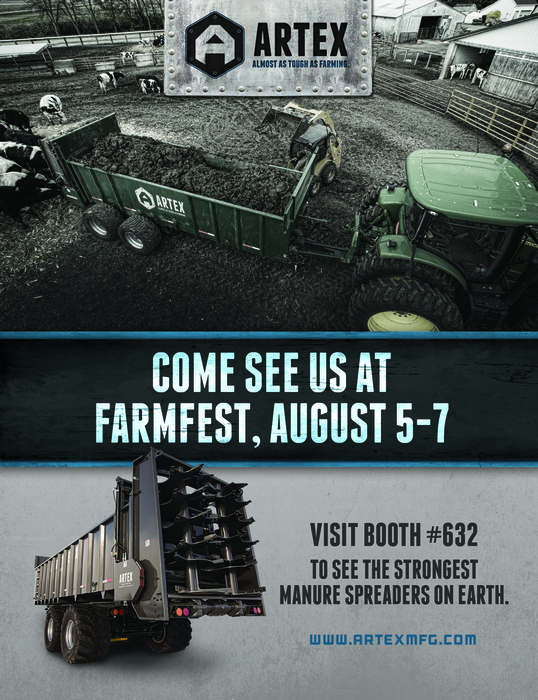 Stop by and see Artex at booth 632 at the Annual Farmfest where we’ll be featuring manure spreaders SB700 & the new SBx700, Combination Silage Spreader Box CB1200 and Silage Trailer TR3606! Plus under the big Artex tent people will be able to view the car crush video on the big screen TV! Farmfest is one of the Largest Agricultural Events in the world and it brings the best products and services to an audience that is drawn from every Minnesota County and has many visitors from five neighboring states. Farmfest hosts many political discussions, education sessions & special events relevant to issues today’s farmers face. Monday, August 5: 8:00 a.m.-5:00 p.m.
Tuesday, August 6: 8:00 a.m.-5:00 p.m.
Wednesday, August 7: 8:00 a.m.-4:00 p.m. Registration for the 2014 Minnesota Farmfest is now open! Pre-registered attendees enjoy half-price admission. Click the “Register Now” button on the Farmfest page. 3-Day Pass – ONLY $15! Save $3 when you purchase a 3-Day pass to Farmfest! This event connects 35,000+ attendees with over 625 local and leading companies in the farming industry. FREE attendee parking is available on the South and West side of the show grounds. NB Golf Cart is the official provider of golf carts for Farmfest. Please contact Toby Bertsch at 605-275-4653 to reserve your cart. Golf carts are provided on a first come, first serve basis. Complimentary on-site shuttle will be circling the show grounds throughout the three days. Look for the FARMFEST SHUTTLE STOP signs and hop on for a ride around the perimeter of the show. Minnesota Valley ATV Riders ATV Club will be at our booth and selling raffle tickets for a chance to win a 4 – wheeler! Please make sure to get yours at the Event! The Artex Team is looking forward to seeing some familiar and new faces at the local event!